Sober Look: Why is the ECB hesitating on monetary easing? Why is the ECB hesitating on monetary easing? The Eurozone's unemployment rate is at 12% and holding while the area's youth unemployment is at staggering 24%. Private lending is still contracting (see post) and disinflationary pressures persist even within the "core" states (see chart). The price stability situation in the "periphery" is starting to look outright deflationary - see chart. The euro is still at mulit-year highs, putting pressure on the area's export businesses. At the same time monetary conditions continue to tighten as the area's central banking system balance sheet approaches pre-LTRO levels. 1. This may upset some folks but the reality is that the ECB is notoriously indecisive as it is pulled into various directions by the member states. Many forget that the institution is relatively new (just over 15 years in existence) and the shock of the recent crisis had left the organization a bit paralyzed. It rarely takes a decisive action unless it's forced by the markets to do so. The decision to "save the euro" only arose as Spain approached the point of "no return". 2. The ECB is also somewhat distracted as it prepares to take on the massive task of regulating the area's banking system - a responsibility that was not initially part of the central bank's charter. 3. 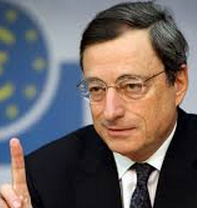 The ECB does not have the dual mandate of the Fed and is only focused on price stability. The central bank views the area's horrible unemployment problem as being outside of its "jurisdiction". While technically correct, many central bankers would regard this narrow interpretation of the rules as shortsighted. 4. The hawks at the ECB continue to view the disinflationary pressures in the euro area as transient. Reuters: - The ECB is running official interest rates at a record low but unlike other major central banks has resisted calls to follow that move with outright "quantitative easing" to pump more money into the economy. [Bundesbank President Jens] Weidmann said that about two thirds of the falloff in euro zone inflation to 0.7 percent, the lowest since the economy was deep in recession in 2009, could be attributed to falls in energy and food prices. "Monetary policy should respond to such factors only in the event of second round effects," he told a conference in Berlin, saying he would not talk about current monetary policy ahead of the ECB's monthly policy meeting next Thursday. "With regard to the rate of inflation at the moment, the euro area is not in a self-enforcing downward spiral of price decreases, which is nominally the definition of deflation," he said. 5. The ECB has been heavily focused on the recent improvements in corporate growth, particularly the PMI indicators. Markit indices for example show a steady recovery from the 2012 lows. Mario Draghi has been speaking about these improvements lately but he continues to ignore some warning signs hidden in these numbers. Markit: - Policymakers will be encouraged by the survey in terms of the signs of sustained recovery. However, concerns will persist regarding the deflationary forces, especially in the periphery. With prices charged by manufacturers and service providers both falling again in March, there remains an argument for further stimulus, especially if the rate of growth of activity cools again in April. 6. The central bank is also hanging its hat on improving sentiment surveys in the euro area - see Twitter post. The thought is that if consumers and businesses are happy, credit growth will somehow stabilize. Perhaps. But the mood of these crisis-weary survey participants can easily turn if the area's labor markets do not heal soon. 7. The policymakers are also betting on the fact that the rapidly falling long-term rates in the Eurozone periphery will provide some "natural" stimulus to the area's economy. Indeed, as the markets perceive lower risks of default, the yield declines on longer-dated periphery sovereign paper have been quite spectacular. The OMT backstop provided by the ECB has certainly helped. The reason behind these recent sharp declines in yield however has to do with bets on disinflationary pressures and a subsequent easing action by the ECB. Reuters: - Spanish, Italian and Portuguese bond yields hit multi-year lows on Thursday, with speculation about further European Central Bank monetary policy easing prompting investors to seek the bigger returns offered by lower-rated assets. 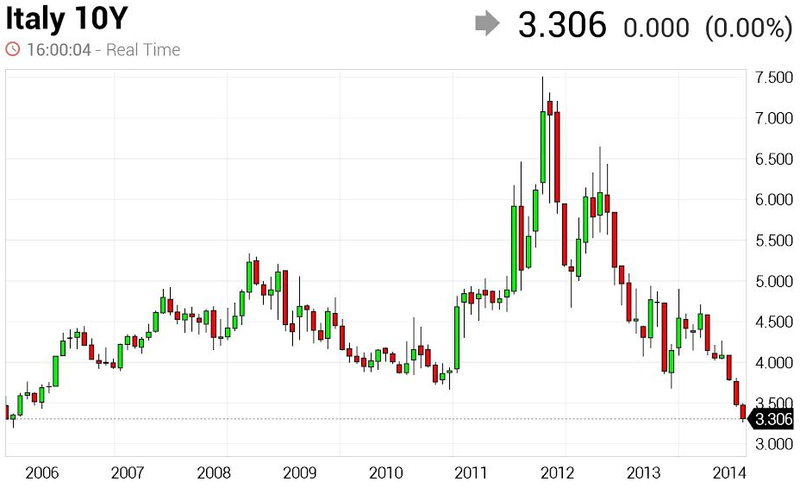 Should the ECB fail to act, these yields will inevitably rise. It is also important to note that low government borrowing costs are no guarantee of stimulus to the private sector. The private sector can not or is unwilling to borrow, reducing the impact of lower benchmark rates. Ultimately the ECB could be right and some day, as the banking system is "restructured", the Eurozone's economy will heal itself. But that was also the attitude in Japan years ago when the nation undertook its banking reform. 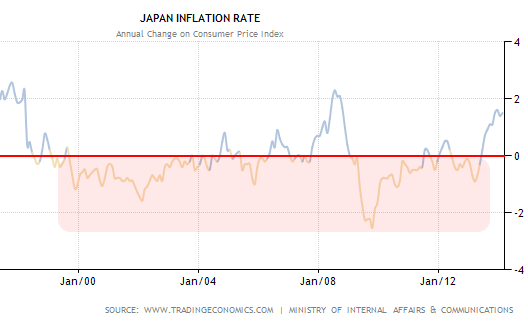 Yet deflation in Japan persisted for years since then, becoming heavily entrenched in the economy. Is the ECB now willing to take that chance? Update: More CPI results from the Eurozone are out this morning. a. Here is the latest aggregate euro area CPI result.